Did you know March is craft month? How fun is that? In honor of crafting, Color Crazy is giving away complete kits to create beautiful locker hooked designs. One for every week of the month. 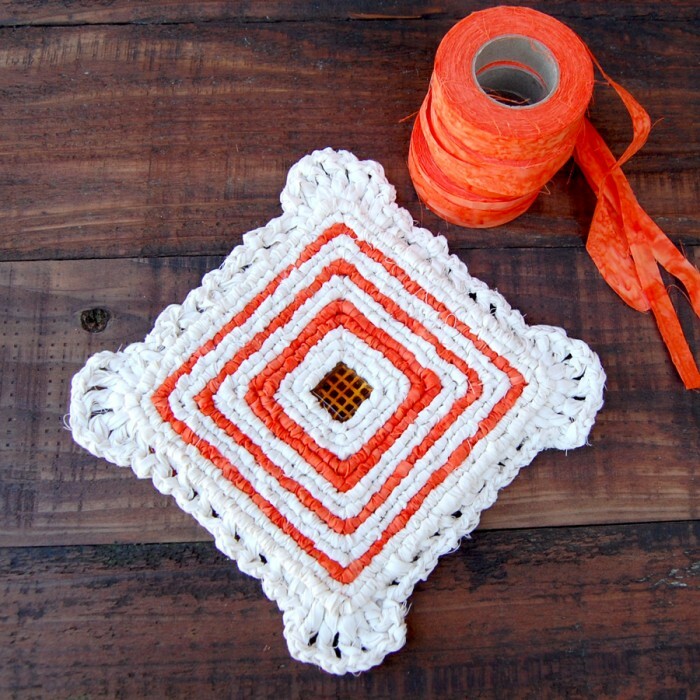 The first giveaway is the pattern and materials to make the Scallop Frame Trivet below with a crocheted frame and glass tile accent. I’ll also include an autographed copy of Locking Loops. You can find the free pattern on Color Crazy. Yes, you can add crochet accents to locker hooked designs. I’m thinking a runner would be exceptionally beautiful. To win post on this blog about why you like locker hooking and I’ll select a winner at the end of each week on what I’ll call “Color Crazy Fridays.” I’ll choose the first winner on 3/9. Stay tuned for more designs and giveaways each Friday this month. The post Colorful Giveaways–Honoring Craft Month with Color Crazy Fridays appeared first on Color Crazy.